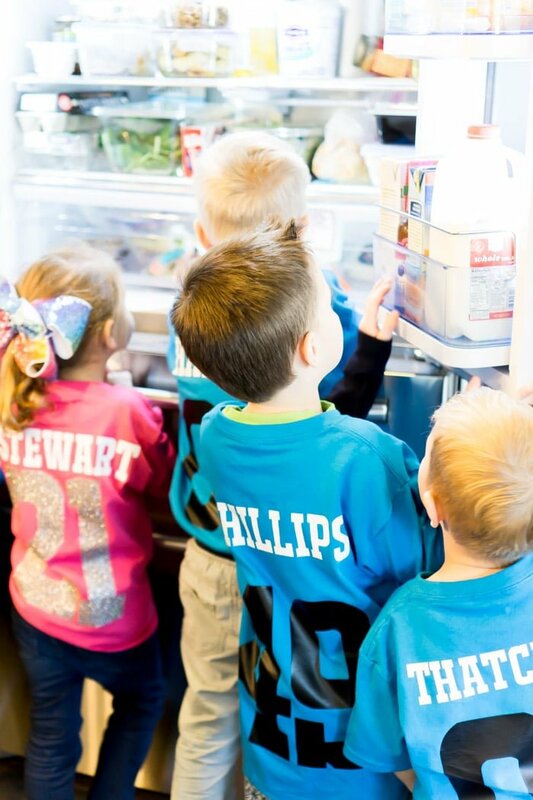 This football scavenger hunt for kids is perfect for getting kids excited about the big game! 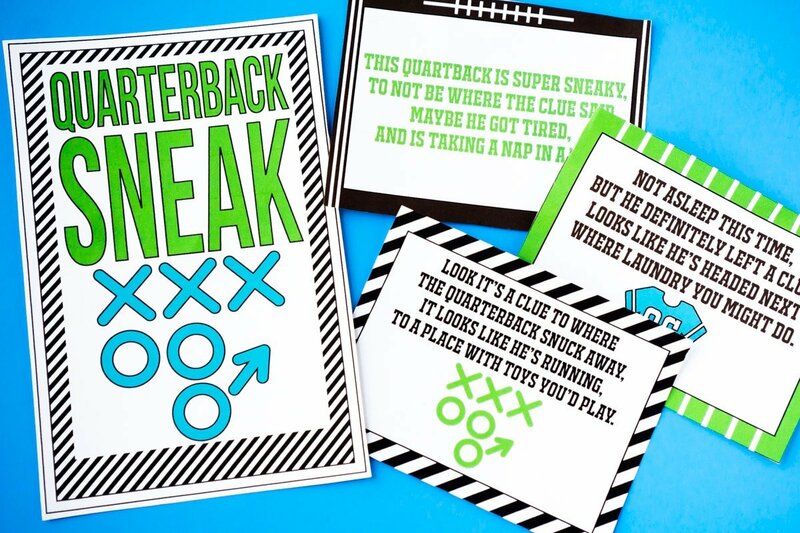 Whether it’s for a Super Bowl party or just a football themed birthday party, kids will love trying to chase down the quarterback who snuck away! 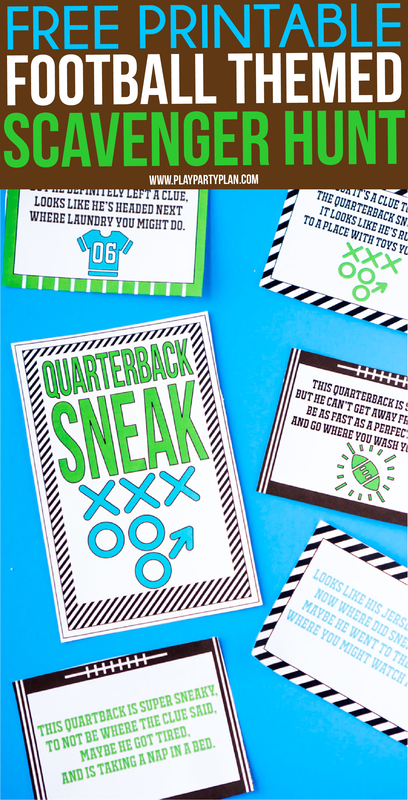 With cute free printables, prize ideas, and more – this is the perfect game for kids who love football or just a fun scavenger hunt! 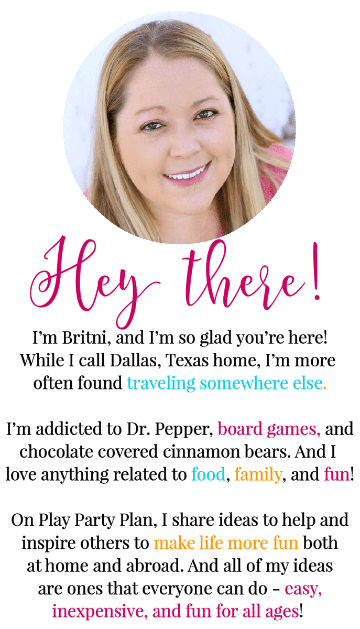 One of my favorite things to do is to create games with corny titles like my put a ring on it bridal shower games or my pot of Gold St. Patrick’s Day games! 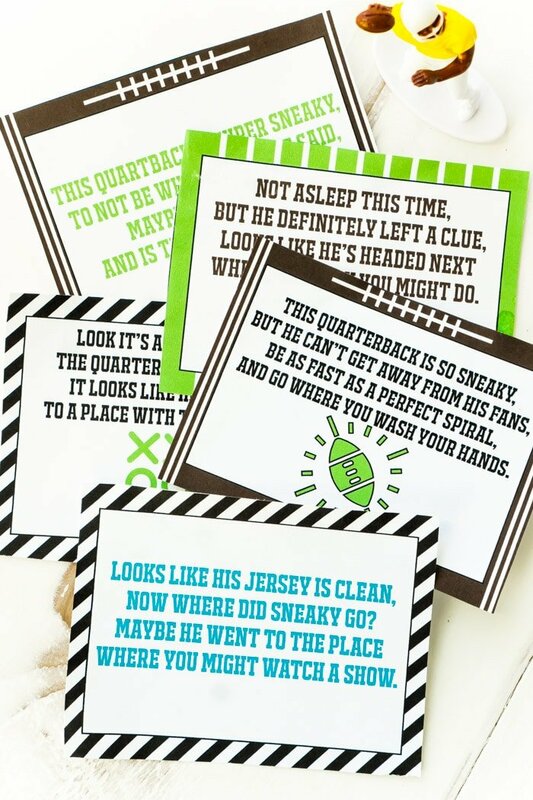 This quarterback sneak football scavenger hunt for kids is no different. I sat down and brainstormed all sorts of football phrases, football terms, common football plays, and more with my football loving husband for this football bingo game and decided instead of just putting the words on the bingo cards, I should turn some of those phrases into their own individual games! 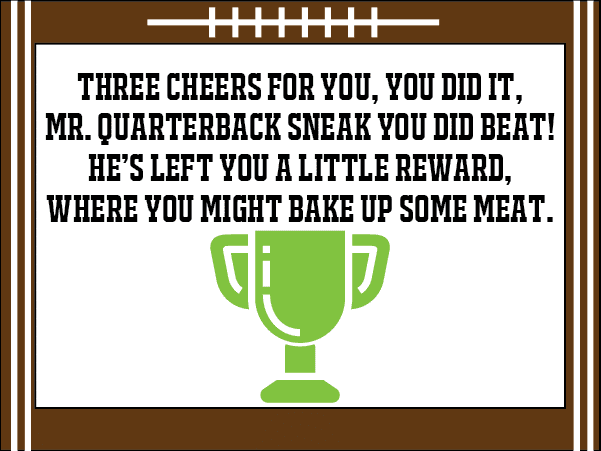 In this scavenger hunt, kids are on the hunt to find the quarterback who snuck away from them. Quarterback sneak, get it? Yeah, I know! It’s corny but I love it. The clues kind of all tie to each other and read like the kids are actually searching for the quarterback scavenger hunt. I thought it was cute, the kids thought it was cute, and I hope you do too! We played this at our kids’ game day party and the kids loved the scavenger hunt. It was actually hilarious because after they finished the hunt, they immediately came down and asked if I could do another one with the clues in different places. If only that’s how it worked. 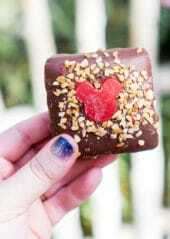 But this was definitely the big hit of the day! If you’ve never done a scavenger hunt like this with your kids, you’re totally missing out. 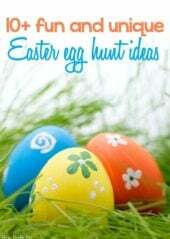 I do them pretty much for every holiday or major event with my 4-year-old, and they may be his favorite thing ever. That or the Lego Star Wars game I got him for the Wii for Christmas. It’s toss-up, or is it a coin toss? Ha, I need more sleep apparently. So the way this scavenger hunt works is that you download the free printable clues I made. Download and cut them out. Then you put those clues in the place they go in your house. I always try to make any of my scavenger hunt clues generic enough that they’ll work in any house that has typical things like a fridge, an oven, a table to eat at, etc. If you don’t have something in your house, you can either just put it in the next best place (that your kids will understand) or just skip that clue altogether. The hunt keeps going even if you skip one clue. I recommend setting up your hunt while your kids are at school, in bed, or otherwise distracted in some way. It’s no fun if the kids actually see you put the hunt together! There is one clue that leads to their bed, but you could easily do that quickly once they’re awake. 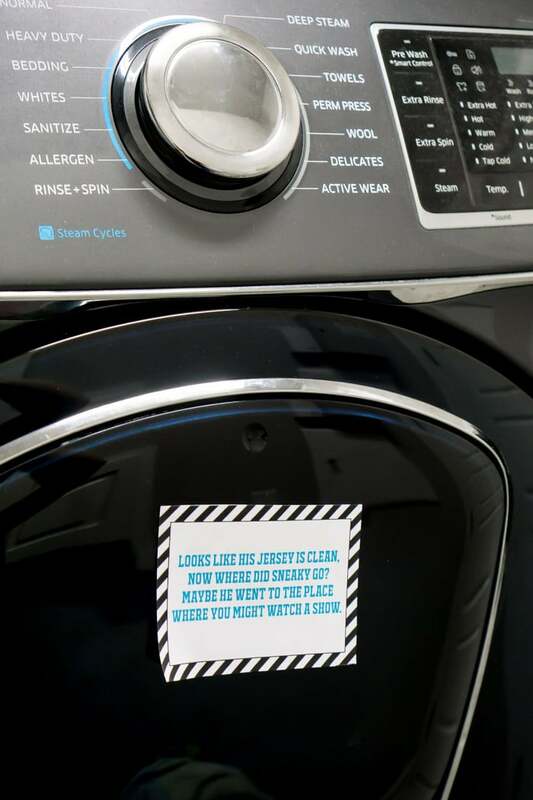 Oh and depending on how old your kids are, it can also be fun to hide the clues in their locations. I don’t because well my 4-year-old isn’t so great at searching for clues yet, but that time is coming quickly! Once the hunt is setup, get your kids in one place and either give them the first clue or if they’re not old enough to read the clues, read the first clue to them. Just be aware that they’re likely going to bolt to where they think the next clue is, even if you aren’t finished yet. Most clues give away the next clue’s location pretty quickly and the kids at our football party were on their way before they even finished reading the clue! So put on your running shoes on and run along with them because that’s one of the best parts of the scavenger hunt! You’ll notice that the final clue in the printable leads to a location but doesn’t have a final clue. It more or less says that the quarterback left them a prize of some sort. That’s one of the fun parts of a scavenger hunt – finding the treasure at the end! I created a two-page printable PDF document that has 12 clue cards on it. Like I mentioned before, you could easily just do a couple of these cards instead of all 12 but I think your kids will appreciate playing with all 12. Our boys were done really fast when I only did six cards, and I really wish I’d done more. I made these in typical football colors – green, black and white, and brown. If you’d like other colors, email me with your request, and I may be able to help. 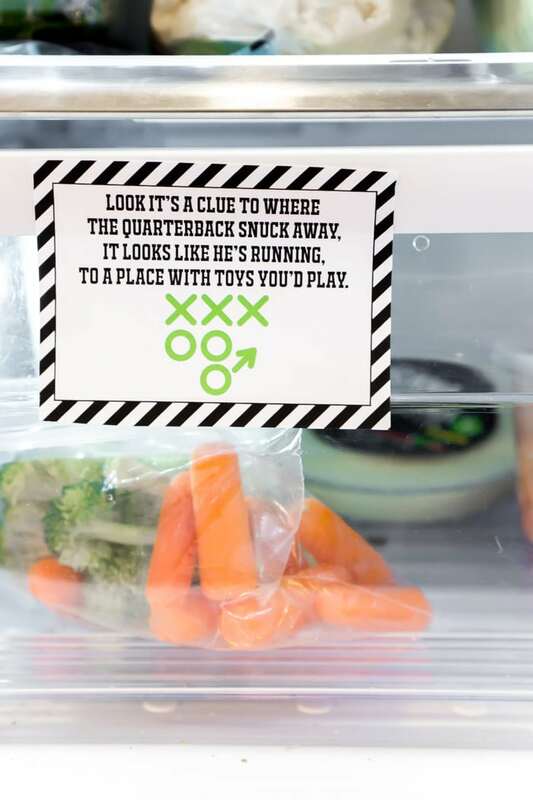 Don’t forget to pin this football Scavenger Hunt for kids for later! Thanks so much for sharing all of your hard work and talents to bring joy to families’ lives! This looks like a great idea. I plan to have my grandchildren during Spring Break and this will be great. I’m entering my email; however, you already have my email information. You should be able to get the link from your email then Velma! Hope your grandkids love it! Loving all the games I have received so far. Keep letting your game lite shine!!! This looks amazing. Thanks so much for thinking this up. Great idea. 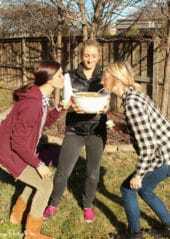 Throwing a party together and this scavenger hunt looks AWESOME! Hoping it will keep the kids busy so adults can watch the game!!! Thank you! !